Twenty minutes from the Nice International Airport, St Paul de Vence is one of the most visited medieval villages in the Cote d’Azur, France. Great artists like Miro, Picasso, Chagall, Jacques Prevert, Yves Montand, James Baldwin and Tobiasse have lived and performed their arts in this epic village. There are numerous resident artists still living nowadays in the village itself, and many beautiful galleries carry on the artistic vibe. One can immediately feel an intense creative engine running in the village. Wandering in the streets of the village is like entering a labyrinth, which can transform an individual in many ways. There are certain things which are very striking about St. Paul. Many visitors talk about feeling a strong energy field. Some feel a strange vibration in the point of the third eye, located between the eyebrows. Such feelings are usually associated with sacred places in different parts of the world. What could be the origin of this phenomenon in St. Paul de Vence? The village is endowed with natural beauty. Located on top of a hill and largely surrounded by a natural forest, it overlooks the Mediterranean Sea and majestic mountains. There is something peculiar about the design of the village that reminds me of my spiritual experiences in India. 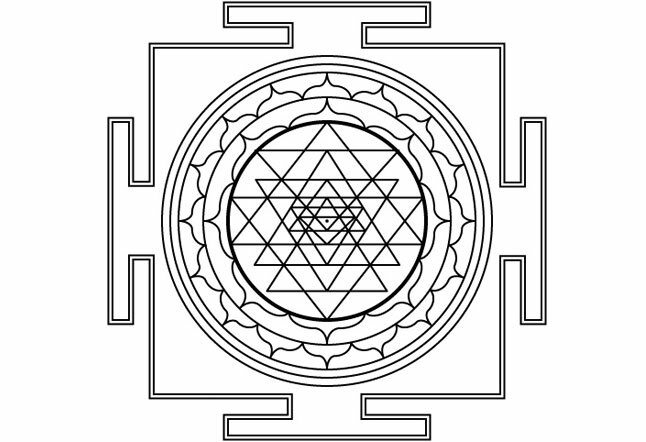 The Sri Yantra is a type of mystical diagram, known as a yantra, found in the Shri Vidya school of Hindu tantra. The diagram is formed by nine interlocking triangles that surround and radiate out from the central point. The two dimensional Sri Chakra, when it is projected into three dimensions, is called a Maha Meru. Sri Yantra symbolises the building blocks of the universe. It's been placed in different temples of India. Chants are an important part of this science. It's a science which combines geometry and mysticism of sound. The practitioner reaches a high state of consciousness where he understands the Natural laws of the universe. This leads to Ultimate Liberation or Enlightenment. Shri Yantra gets energised by the chanting process and develops an energy field. Saint Paul de Vence resembles a Shri Yantra. This is the first important key into understanding the mystical energy field which surrounds Saint Paul de Vence. The builders of the village, such as Francois 1, were known Alchemists. In the 15th Century, knowledge of the Eastern doctrines through the Arabs had reached France. It's very likely the builders of the village had an understanding of Shri Yantra or sacred geometry models. With the arrival of the artists, an aura of creative energy has been given to the village. There are two other important elements from the Spiritual sciences which are present in the design of the village. It's the presence of the map of the human energy system and Kabbalah symbol of the Tree of life. The human energy system, or subtle body, is made of numerous energy channels. There are three main channels - Sun (Pingala Nadi), Moon (Ida Nadi) and Central channel (Sushumna Nadi). 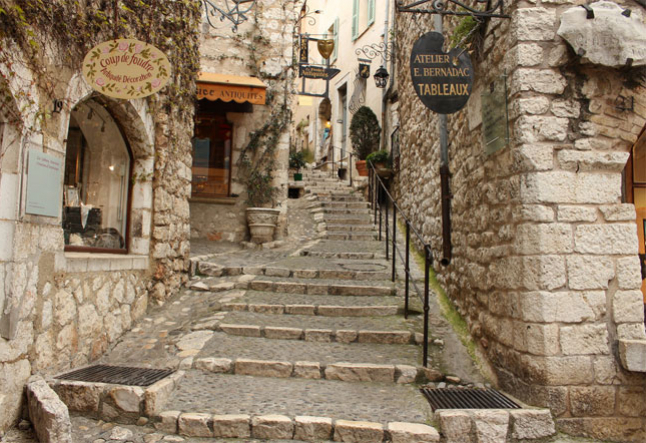 Saint Paul de Vence, like the human energy system, has three main streets - Rue Grande, Eastern and Western Remparts. And they all ending at the cemetery. This matches the human energy system. When you enter the main gate of the village, it's like entering from the lower chakras. As you walk on the rue Grande, it's like walking along the shushunna (central channel). At the end of the village is the cemetery, which represents the crown chakra. It is also the point where all the streets meet. So as you walk along the village, it's as though you are travelling along Energy lines inside a Shri Yantra designed to take you to the highest peaks of consciousness, where you realise the mystery of death itself. The third is the Kabbalah symbol of the Tree of Life, which can also fit into the design of the village. All these design elements are giving Saint Paul it's alchemical significance. If you are open to it, you will feel the magic in Saint Paul. You may even begin to comprehend the ideas which govern the universe. It will drive you to create more beauty. It will bring calmness and wisdom to you. These are the most important things in our lives. Luxury resorts all over the world have begun to adopt yoga as a main feature, attracting amateur and expert yogis alike. LOOK WHO IS “DOING IT" WRITING ABOUT TRAVEL! !